Another 5k...Last year my time was 53:45. This time with David, Carmen and Julie (her second). And we all finished…David had his best time of 47:26. I am happy I finished 55:59 not my best time at all…but finished. Love these people so much, had fun….made new friends…yes, feeling really lucky. I went to my couch to 5k program last night and truly struggled. I am still sore from the Princess 5k, and the seven hour drive home. Ugh. I know that this is temporary, but really feeling defeated. I thought I was going to be good and strong and I wasn’t. I still walked but wasn’t fast or even my normal. Ugh. Again…temporarily feeling. It will pass. Well, the worst part was getting up at 3 am! Yes, 3:00 am!! We had to be in our sections by 5:00 a.m. So bus transports to the EPCOT staging area, walked around a bit, chatted with others, and got nervous. Y’all! I did this…well, Carmen and I did this! And survived…eh, sort of! It was 74 degrees and about 80 percent humidity. Ugh…not the best for this type of race…but again we survived. Disney knows how to put on an event. Bucket list. So I have on my bucket list as a Disney 1/2 Marathon (walking), but participating in a Disney Run is satisfying!! Not the most flattering picture…but I will take it! I cried when I crossed the finish line…Y’all – four years ago I had to have a scooter to be able to survive our family trip to Disney. I could never had walk over 20,000 steps. So very grateful for my gastric sleeve, even with my 30 pound regain, for the opportunities to enjoy my life again. To be able to experience these types of events with my friends and family is truly the BEST thing…truly grateful. My Passion Planner thought for the week…I like this. I am learning and growing…will explain later. LSU Baseball…again…my weekend with Carmen after my 5k Lucky Leprechaun that morning, drove for 5 hours, then dinner. Yes, we had to eat. Then we went to see if there were any seats left at the game. Well, the rain helped for the empty seats, and the score did as well. We got in for free, and seats at 3rd base. Free seats weren’t bad at all. We even made it on National TV – ESPN – David recorded it on his phone. I am not sure why I am so wiggly…but Carmen and I make the same facial expressions. Yes she is mine, and I can’t deny it with this video! We had a great time. Home, bed, and then up for the Founder’s Day events on Saturday. But first, selfies. Love her. I beat my time! Not by much but we did it!! Ho Ho Hustle 5k is today. The low is supposed to be below freezing, and the high only 44. Last year was cold as well. It was 35 degrees when when finished. 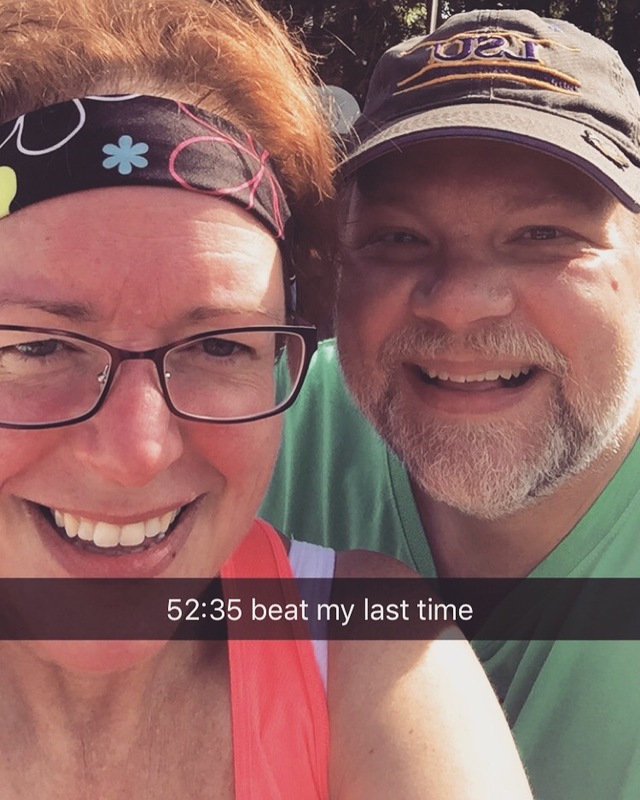 That was my first Walking 5k that we did last December. I hope to beat my time of 59:43 this year! I DID!! 54:22!!!! Not my best but so happy!! Last Saturday, David and I participated in the Emerald Coast Crime Stoppers Mud Bug 5k. It is a great fund raiser, and got in another try at a 5k. It was hot, and I hadn’t been working on my time or walking in general. I finished at 52:35 which was a minute less than the Lucky Leprechaun 5k that we did in March. Again, just to be able to complete it is so much more than what I would have thought a year ago. So only one more to do for the year to reach my 5k goal (3 this year total). I think we will end up doing 5, but not going to jinx it.